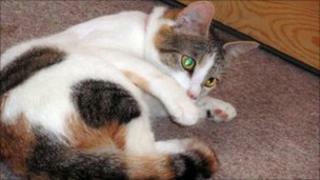 A Dorset family's pet cat is believed to have saved the life of her epileptic owner who stopped breathing. Lilly can sense when 19-year-old Nathan Cooper, from Bournemouth, is about to have a seizure and alerts his mother Tracey. When Mr Cooper stopped breathing during a particularly bad seizure, Lilly kept licking his mouth until he drew breath. Her early warnings also mean the family can move furniture to prevent Mr Cooper from injuring himself. Mrs Cooper said: "Lilly has a very close bond with Nathan, he didn't believe it when I told him what she was doing. "After one fit, he stopped breathing and Lilly started licking his mouth and somehow it kick-started his breathing. "When he came round, from when she licked him into breathing, and Lilly was right there, he just couldn't believe it. "I never knew a cat could do this. "It's made the world of difference to Nathan's life and ours. "Being able to get to him early makes a huge difference." Hospital staff have told the family that animals can sometimes detect impending epileptic fits. The cat recently beat 6,000 other pets to win the Top Cat prize in a competition called My Pet Superstar.